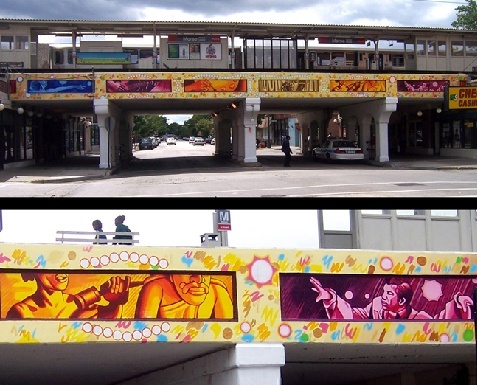 2008 was the first year of the Mile of Murals project. For the first year, we focused on articulating the identity of Rogers Park, a community led by artists and known for its diversity of residents. 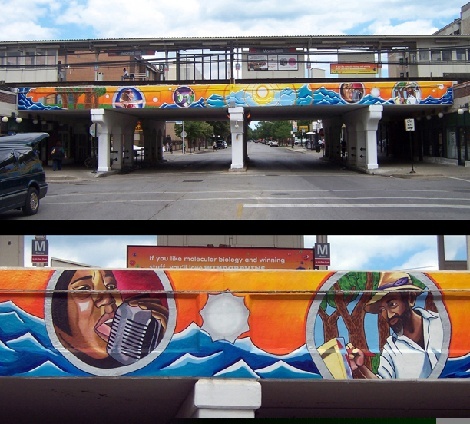 The first mural painted was for the overpass at Morse Avenue's el station, which is a central intersection in the Glenwood Avenue Arts District. The theme for the overpass was "Artistic Movement", showcasing the types of performers, visual artists, and poets that make the neighborhood a true Arts District. The artists for this project, Damon Lamar Reed and Nicole Reed, hail from the Chicago Public Arts Group, who managed the project on the whole.